Restoration works on the ancient Constantine-Helena Church [Andaval Church] located on the Christian holy pilgrimage path in central Turkey's Niğde province, have been completed, the local governor's office said Monday. The church, which is one of the historical landmarks in the city, along with the ancient city of Tyana, Roman water basin and Gümüşler Monastery, was heavily damaged in an explosion in 1977 and had been going through restoration works since 1996. 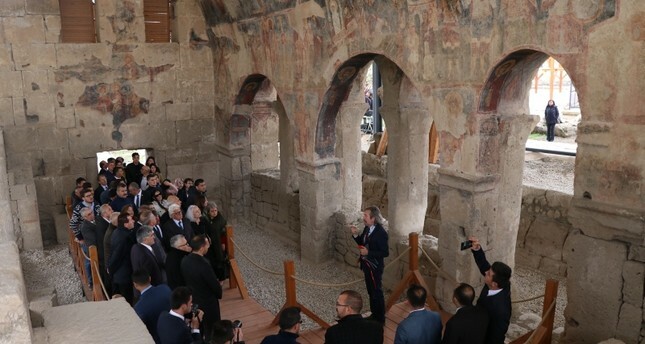 Speaking at the opening ceremony of the church, Niğde Governor Yılmaz Şimşek said that the church has an important place in world history, adding that he hopes the ancient church and the archeological site it is located in will boost the city's tourism. Şimşek noted that the church is the earliest examples of its kind as a stone structure, adding that the paintings on its wall have survived till today. The ceremony was attended by the ruling Justice and Development Party (AK Party)'s deputies from Niğde including Yavuz Ergün and Selim Gütekin, Niğde Mayor Emrah Özdemir, Provincial Museum's Directorate Chairman Fazıl Açıkgöz, Provincial Culture and Tourism Directorate Acting Chairman İsmail Tecimer, Provincial Gendarmery Commander Senior Colonel Garip Gümüş, Provincial Security Directorate Chairman Salim Cebeloğlu and Professor Sacit Pekak, the leading researcher at the excavation works, along with many other guests. The church was constructed under the name of the Roman Emperor Constantine the Great's mother Helena in the sixth century and was located on the historic holy pilgrimage road that started from Bordeaux, France and ended at Jerusalem.